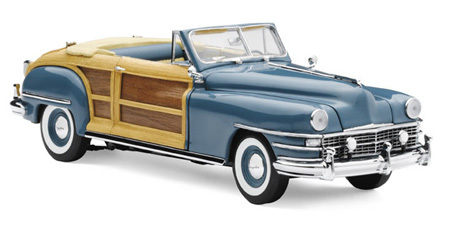 Chrysler made its statement on grandeur in the late ‘40’s with the Town and Country wood-clad convertible cruiser. This die-cast masterpiece is hand-assembled from over 150 parts and precision-detailed to the original 1948 specifications, including rolling tires and functional doors, hood, trunk and steering. The hand-painted Military Blue richly offsets the wood grain panels and Catalina Tan interior.